Sharks are fascinating creatures, sitting proudly at the top of the ocean food chain for millions of years – in fact, they've remained virtually unchanged since long before the time of the dinosaurs. On top of that, they're particularly good at healing themselves and rarely get cancer, with some species even living to the ripe old age of 400. To help decode how the animals can manage these incredible feats, an international team led by scientists from Nova Southeastern University, Cornell University and Monterey Bay Aquarium have now sequenced the great white shark genome. The first thing to note is that the shark's genome is one and a half times larger than that of humans. Within that genetic code, the researchers found that natural selection had given a boost to genes involved in DNA repair, DNA damage response and DNA damage tolerance, which could be behind the animals' resilience against cancer and other age-related diseases. "Not only were there a surprisingly high number of genome stability genes that contained these adaptive changes, but there was also an enrichment of several of these genes, highlighting the importance of this genetic fine-tuning in the white shark," says Mahmood Shivji, co-lead author of the study. Interestingly, the shark genome also contained a particularly high number of genes, known as LINEs, that do the exact opposite – destabilize the genome. These LINEs comprised almost 30 percent of their total genome, which is one of the highest proportions ever seen in vertebrates. 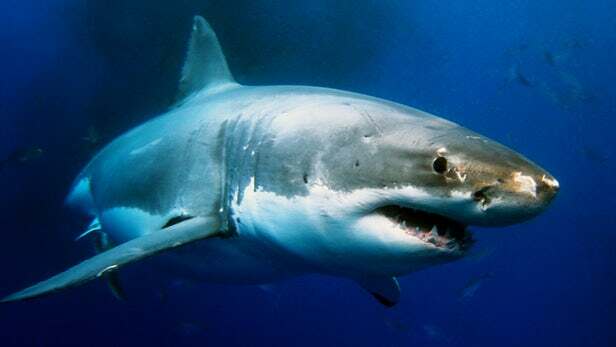 That in turn might be the reason sharks evolved such strong DNA repair genes. "These LINEs are known to cause genome instability by creating double stranded breaks in DNA," says Michael Stanhope, co-lead author of the study. "It's plausible that this proliferation of LINEs in the white shark genome could represent a strong selective agent for the evolution of efficient DNA repair mechanisms, and is reflected in the positive selection and enrichment of so many genome stability genes." The researchers also found that genes related to wound healing and blood clotting had been selected for and enriched, which goes a long way towards explaining how sharks can shake off even large wounds without too much trouble. Many of these beneficial genes were also found in the genome of a related species, the whale shark. Studying the genomes of both animals could help with conservation of sharks, which are increasingly under threat by overfishing and other human activities. We might also be able to find new treatments for cancer and wound healing in humans. "Genome instability is a very important issue in many serious human diseases; now we find that nature has developed clever strategies to maintain the stability of genomes in these large-bodied, long-lived sharks," says Shivji. "There's still tons to be learned from these evolutionary marvels, including information that will potentially be useful to fight cancer and age-related diseases, and improve wound healing treatments in humans, as we uncover how these animals do it."